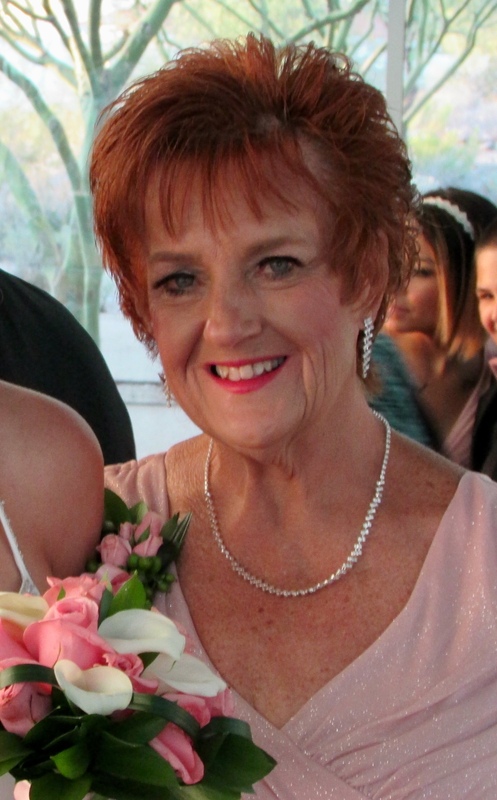 Susan Bromley died unexpectedly on February 1st, 2018 in Gilbert, AZ at the age of 65. Susan was born on December 6, 1952 in Union Town Pennsylvania to John and Genevieve. Her family moved to Arizona when she was 3 years old. She graduated from East High School in Phoenix AZ in 1970. She was blessed with 3 children and set about teaching them how to live life to the fullest. Her children remember her being carefree and loving to travel. She was a kind and gentle mother who encouraged them to pursue their goals. If she made a mistake, her famous lines were “heavens to Betsy” because she dare not curse. She was accomplished at booking travel for her clients and family members, and she would never pass up the chance to take a last-minute adventure to any place she desired. She was a generous and affectionate individual, especially with her grandchildren who truly were the center of her life. She had an infectious laugh and was passionate about her family’s happiness and large Iced Tea…don’t forget the extra ice. She was an active and dedicated member of LA Fitness where she inspired others by her hard work and exercise ethics of riding the bike for 9 miles and water aerobics classes where she was able to lose independently, well over 100 pounds. Susan is preceded in death by her father John Janosik. She is survived by her mother Genevieve (Darst) Janosik; her children, Holly (Chuck) Griffin, Heather (Ed) Glancy, and Hillary (Eddie) Adorno; and her grandchildren Brittany Bromley, Justice Bromley, Mea Griffin, Brendan Glancy, and Madison Griffin. She is also survived by her siblings, Debbie Cunningham (children – Matthew & Ashley and Meghan & Jay), and Nancy Vierck (children – John & Wendy and Jill & Mike). A memorial service is scheduled for 2:00 pm on Saturday February 10th, 2018 at Bunker’s Garden Chapel, 33 North Centennial Way, Mesa, AZ, 85201, with a reception to follow. The family will officiate the ceremony. All are welcome to attend and celebrate Susan’s life. The family would like to thank all the loving support and prayers from family and friends through this heartbreaking time. Please feel free to leave special messages and condolences for the family. My heart hurts from the passing of my dear friend. I’m a better person for having known Susan. She taught me to laugh more, make the most of each minute of the day and be more spontaneous. My love and prayers to Susan’s family and friends. May you celebrate her life and remember all the wonderful moments you’ve had together, just as I will do. Her laugh was contagious. Always so sweet to anyone who crossed her path. I will miss her adventurous personality. She was always ready for that next trip…that next adventure. Goodbye to a great person, friend, and coworker for so many years. Thank you for making me smile and laugh with your quirky sayings…”Heaven’s to Betsy!”….I’m sad to say goodbye. Luv ya!! I am so saddened by this loss. Susan had a love for life and made the most of everyday! Heaven has gained an angel. Until we meet again, rest peacefully, friend. Susan will be deeply missed. She always lived life as an exciting adventure! The Angels in heaven will love you and your contagious laugh, just as I did. My love and prayers to Susan’s family. From this day forward, there will be a void in my world. There will be a hole in my heart that will never be filled. Susan’s smile and laughter were contagious and infectious. My memories of our time together, even though it was way too short, will be with me forever. I will still think of her every day. I could go on forever about Susan, and what a wonderful, kind and beautiful person she was, and how truly blessed I was to know her, so instead I will say this to her…… “I’ll tell you all about it when I see you again…..My Tuesdays will never be the same ….Stop and smell the roses…..And where ever you are my dear friend, may you please rest in peace and stop worrying” All my love, today and always. I will never forget Susan and her unexpected passing leaves a hole in my life. It has been my privilege and honor to have known her. I love her so much. I did not know Susan that well, but she was my work buddy. We would email and IM when each of us needed time off. She was always pleasant and kind to me. I will miss working with her. Susan will be greatly missed. Always so sweet to everyone, her joie de vivre and adventurous spirit lit up every room she entered. It as been a pleasure working with her and knowing her for the past 7 1/2 years. Hearing of Susan’s passing has deeply saddened me. I have known Susan for over 15 years. From first meeting her at American Express , to having her as my employee , planning and traveling on numerous FAM trips together and spending 3 weeks in Cleveland training with BCD. She was always ready no matter what was in front of her. My heartfelt condolences go out to the family. I will surely miss the presence of the truly lovely and kind person she was. Rest in peace Susan…. Susan was such a warm and loving presence in our lives. We are heartbroken. She spoiled our children (Sophie & Graham) with affection each time she saw them. We are so grateful to have known Susan and our hearts are with her family. Sending my condolences, thoughts and prayers to Susan’s family and all who were touched by her heart of gold. Susan was always very warm, kind and welcoming toward me. I loved how she was so loving toward my grandchildren Sophie and Graham. Rest in Peace Susan. My deepest condolences. You will be missed my friend. We have another Angel watching over us. Truly a sad time for us left behind. Susan’s cheerful way was so infectious that she made everyone around her smile. Many times her smile and laugh cheered me up and made my day better. Love and prayers to those who miss her. She will always be a joyful spirit and memory. My deep condolences to the Bromley family, I was really touched by the loss of your loved one. When a precious loved one falls asleep in death, it brings to mind God’s precious son Jesus. It is comforting to note how he viewed death. I would like to share it with you from the gift that the Most High God has given to each & everyone of us. His written word the Bible in the Book of John chapter 11 verses 11-14. I was completely shocked to hear about Susan’s sudden passing. I will always remember her infectious laugh, good nature, and smiling face. Rest in peace my friend. Sincere condolences to Susan’s family and friends. Thoughts and prayers for all. Dearest aunt Susan will be sorely missed. Her smile and laughter was contagious and warmed a room. We’ll be forever grateful for her support; she was a particular inspiration for our Ironman training and race. Her cheers for Matt and I could be heard at each cheering opportunity. Her love for family, friends, and colleagues was insurmountable. May you rest in peace and those left behind carry on the joys of living each day to the fullest. Mere words cannot express my feelings when I read this oh so very sad news. My most heartfelt, sincerest condolences go to her entire family. RIP, dearest Susan. My love for you is eternal.